This "Enigma" tapestry is a modern art work of artist Roel Daves. His works show a boldness and modernity which at the same time uses delicate little motifs from nature. In this piece, we see leaves and stars amongst these motifs to create a work that has both soft blending of olive brown and grey cyan areas of color, both of which are sophisticated and distinctive colors, as well as more detailed and active components of intricate details. Leaves and their details are seen on various parts of the work. 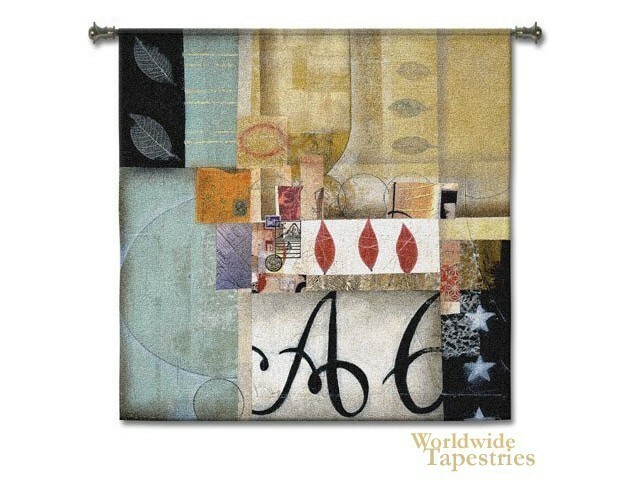 This modern and contemporary tapestry "Enigma" is backed with a lining and has a tunnel for easy hanging. Note: tapestry rod, where pictured, is not included in the price.